This market remains a mess, though perhaps some semblance of order is beginning to emerge from the chaos. Way back on Friday the 13th, I suggested that the market would form some type of "double retracement" due to the extended fifth wave. What threw me off heading into yesterday was that it looked like we'd already had that double retracement. Turns out the market felt we needed another retracement just for good measure. The market seemingly felt obligated to cheer on good old Uncle Ben yesterday and, no doubt, cries of "Win one for the Beard!" could be heard echoing throughout the halls of Primary Dealers everywhere. It's vitually impossible to predict this type of market in advance. To a degree, it can be predicted in real-time... but looking at charts from one day to the next, it's quite difficult to anticipate a correction of this complexity. The mess at the beginning of the wave makes predicting its resolution somewhat challenging as well. I'm inclined to believe this is a 3-3-5 expanded flat, as I mentioned yesterday morning. In that case, it's nearly complete. It may have a bit more down/up first -- my "perfect world" target would be 1397-1399 for completion -- but it's also possible that it completed yesterday. There are two counts shown. The count not shown is represented by the red box -- another repeat of the fractal within the box, to stretch the correction out even farther, is possible. In the bigger picture, I still favor continued downside after this correction is complete (assuming that ever happens). The alternate count remains as a possible bottom at 1357. I view that as unlikely. Yesterday pre-open, I mentioned that I believed the Euro/USD currency pair was forming an ending diagonal. I wasn't sure if it was complete, or had one more wave up left in it. Today, we got that wave up, and the pair has now formed what appears to be a complete textbook ending diagonal. 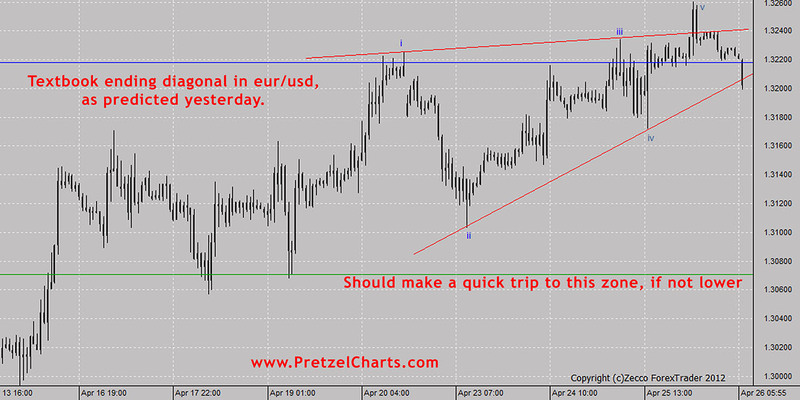 There should be strong selling in store for Euro over the near term. This is a particularly good diagonal because that last wave up ran a ton of stops -- I watched it unfold, and actually played it on the long side. Caught a few quick bucks as a momentum play, then I sold my longs to all the shorts who were covering. But I imagine a lot of shorts will have to chase now, which should give it some fuel down. Diagonals can be misleading, and it's still possible that the wave labeled v is actually iii, but in this case, that seems much less likely. In conclusion, I continue to favor an ultimate downside resolution to this mess. In a perfect world, this correction may or may not have a tad more upside left, but should be over fairly soon. Trade safe. Top of the morning to you PL......hope your daily life gets back to normal soon. Overnight SPX. INDU and NDX look pretty much the same. FYI. Looks an interesting day ahead. "Win one for the Beard!" - that's classic. Appreciate the update & may all go well for your and your family. Thanks for the update PL. Does anybody know if there is an ETF play for the Euro/USD? Or you can open an account at Zecco Forex using the link in the right sidebar, fund it with a credit card, and start trading eur/usd instantly on as little as $300 margin. Setting ourselves up for an implosion I reckon. Anyone else notice how rosy bloomberg.com was last night? Was euphoria central. Looks like CVX did indeed finish the first wave down at 100.51, as suspected. This is the larger degree 2nd wave rally. Been hard to get a ST read there, but it looks like it might be headed to 108ish. Morning Bob. I'm sure you are watching CVX. What do you think on this day before earnings? I think I'll just stick with stocks and ETF's. Thanks anyway. Any recommendations on CVX this morning? See above. Haven't made a recommendation because I haven't been able to get a solid read on it. That's why it's often best to just take profits and sit tight when it looks like 5-waves are done, and targets have been hit. Still don't have a great read on it, but it looks like it's in the middle of a 3rd wave up -- possibly c of 2 of an expanded flat. Extended fifth waves are often doubly retraced and CVX is right at wave 2 of the extended fifth wave down today. Will stay short unless CVX breaks above wave 2 area. PL-Thanks for the update on CVX. I was thinking with my limited experience this did not look like a 4th wave anymore. Hope everything is going as well as can be expected for you and your family. It seems as we get older and older the amount of funerals we attend increases, but it never gets easier. Posted this just a few minutes ago. EUO - Proshares Ultrashort Euro. thanks pretzel for the update on this...I actually took this short and have now placed my stop above the high we just hit. Win some lose some. I haven't traded CVX until today, but actually decided to take a tiny June Put on CVX on the theory that we are C = 1.618*A in this wave up. If it goes to 108, I'll just add another tiny position... Thanks for all your hard work and my condolences for your loss this week. For 1 year time frame, DJI is close to it's 13,144.77 peak. It did it twice today but failed three times. It just failed the third time. Down goes the DOW and Up goes the VIX. bailed on that little retrace....took my loss and movin on. Fortunately with the retrace I cut the loss in half. did anyone watch DJT going the other direction today (because of DOW?)... 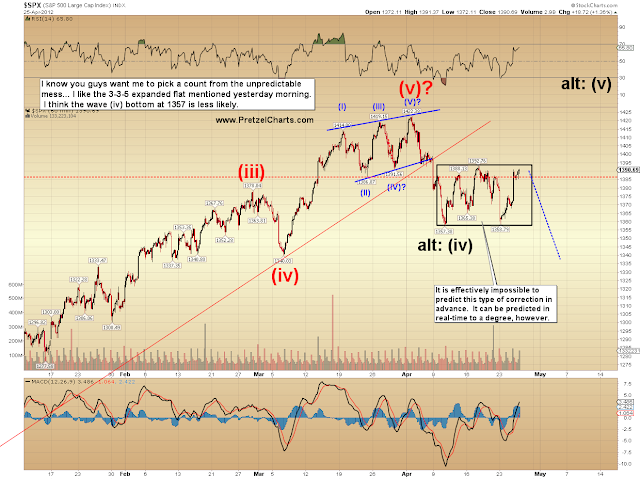 no conformation of the rally (in dji/comp/rut/spx)? If it breaks those recent lows, it could drop like a rock. direction is down for ROD, pretty sure about that based on doji on the 15 and twin pipes on the 120, right where they should be. By EOD we will be lower me thinks. Do ppl know how to place stop loss (SL) positions? ES short from 89 SL moved to 88. . . .
What if this isn't an extended fifth wave? If the Dow finishes green, it would have closed above the 50 day moving average after making two higher lows and a higher high. I can see this as a the beginning of a continuation of the past uptrend. The euro pattern also doesn't strike me as one that will break down right away. Perhaps in a few days, but at the moment it keeps making higher highs and higher lows. This matches up with UKDNY's Ichy Moku analysis. See the chart that he posted yesterday. It shows a target somewhere above 107. SDx topped at 1393.25 just a whisker above the prior high so all guidelines are now met and descent can commence. Have you seen AAPl? just play the channels with the EW counts I keep mentioning, this is too fast to count it yourself, need eSignal auto pilot (LOL), put a regression channel on a short time frame, say the 3 or 5 min. Sounds like me. I'm the guy with the cloud following him around. Bob, I am thinking the gap areas on the 60 and 120 min charts show a propensity to gap across 107.17. Looks like that might be an entry point to the short trade longer term. Fits with fourth wave overthrow of major trend. this is what it is doin' me thinks, it is putting in the EW2 on the 120 minute. put an EW5 above those twin pipes at 3 am, a EW1 at 8 am, and now I think it is playing with putting in an EW2. Re Euro - its recent peak at 1.3391 on 3/27 then to 1.30 on 4/16 = nice easy math, .0391. A .618 fib retrace of that break takes it to @ 1.3242 - a stone's curl (for my CAD friends) from where we are today. Does it mean it WILL turn here? No. Does it mean the probabilities are good for a turn here? Yes. play the EW1 to 3s, do not expect the 5 to finish, reverse at the 3. Thanks DRG62.....shorting at $103.67 I was looking for wave 4 to capitulate and send 5 down to $92. Backup plan is/was if PL was right, and fifth wave was extended and complete at $100.51, then extended fifth waves often doubly retrace to the second wave within the fifth down....which is right were CVX is now. Plan now is to cover short at $99-100 as it retraces, then ride CVX back up near $108 in Wave 2, which is near the fourth wave of lesser degree and a 50-62% retracement of wave 1 down. I always wondered this too, but they are there. Thanks for imparting your depth of knowledge, I appreciate it. look at a 60 min. es chart, think we are in a 3 of 5, the 5 being set at 1395 es. 5 ES point rise (length of EW1) times 1.618 equals 8.09 plus 82.25 (EW2 low) equals 90.25 for EW3 (minor) tgt. We just hit a high of 89.75. so we are backing off (very slight) to about 86???? for EW4 (minor) low. . . or we do a quick run up to 90.25, then down to 86-7.
add 4 to my ES numbers to get $SPX. think another failed EW5 move is possibly ahead, truncating at 89.75 (close to my 90.25 EW3 mathematical level). . .
Is it not more likely that the averages will make new highs before declining? What if the last two lows are the end of the downtrend? If the day finishes green, the NYSE, Dow, and SPX would have all had three straight up days while the VIX did the opposite. Does this not bode well for higher future prices? I don't this short opportunity coming up is going to provide an entry this afternoon until late in the when traders start to worry about being in front of GDP numbers tomorrow. This thing has been a major PITA to track and count. RUT approaching point of resistance at down trend line from the first 1,2 on the 60/120 min charts. Thanks for the call. And a nice count. Scary RT to hold your breath, but still in line. Could work out well, as some 1,2 open in my EURbear scenario. EDT would fit quite perfect. little silver update. minimum target hit. loved Beano, my great aunt used to buy me that together with Dandy every thursday. 2d each...magic. American consumer: "I'm spending so much money on gas. What will I do?! I know! Buy a new car!" I will never understand this attitude. If your commuting expenses worry you, buy a $2000 car from craigslist. Even if you spend twice as much gas in that car as your new Focus, at 5 dollars/gallon, it will take you more than 50K miles to break even. And you're not paying interest on a loan. And you're can knock down your insurance bill to just liability coverage. Now there's some savings. Don't let Ben hear you...the only thing driving the U.S. economy is consumer spending, oh...and student loans apparently. The joys of central banking and modern monetary theory require debt to create money...Apparently, it doesn't make sense to you either. Right on. My car gets 22 mpg :( but is paid off. I've had the thought to get a better MPG car, then thought, since I don't drive many miles (about 6-7k/yr) whatever I'd save in gas/month would take me forever to recoup in exchange for better mpg. I'll stick with my very nice reliable but not so great fuel economy sedan and enjoy not having a car payment. You trading this K7 ? Respect. Thanks for the update; any approximate time frame on plan B? I've got a nice F-350, and it takes diesel, but it's been paid off from the get-go. I don't do more than 5-6K miles per year, so it's cheaper to stay with the big beast. Still has nice resale value, too, due to low mileage. yes Bob_E, back in recession, FTSE response, gap up and a boom up by 50% in next 30 mins, madness. Trouble is, it ain't over yet and the politicians seem oblivious to what is going on. No need to state the obvious, they have no idea what to do. And the US is next! I really appreciate these videos. They help me understand how the OpVol market is used. I get 18mpg, takes premium, owe $8K, and pay a lot for collision coverage... the worst of all worlds! Except I bought used. But I don't pretend to care about commuting costs. I bought the car 'cause I like it and can afford it. Thanks for your EW Principle doc from the other day. Took it to bed last night and have it on my desk this morning. I do have a question about general directions (long term impulses). What I got from F&P is that Elliott sees the markets as being in a very long term up wave, with the inherent corrections alternating along the way. But what about a chart like that of UVXY? I know it's not a stock, but from its outset it's been on a steep downslope. What does this mean, in terms of EWT? Is it terminally headed into zero? But what if it is not? What if it keeps going higher? When does this mindset change? I only say this because it looks like that to me, yet my judgement hasn't been consistent enough to make a good trader (yet). What makes this view of the current price action incorrect? The Plunge Protection Team must be chugging the Gatorade and double-knotting their laces about now. I am picking up loose and dropped change off of big board floor. . .
RUT is about to fill its gap from April 5 (816.43). I expect that gets filled before any sizable down move. Is there an alternative way of interpreting this that does not result in any downside move? Dr., what is your S&P Ichi chart foreshadowing? LOL thought this "Be a patriot! Get in debt now! So the Bernank doesn't destroy our currency later!" Any diagonal up will result in a move down following it... but perhaps this isn't a diagonal after all? So... yes. 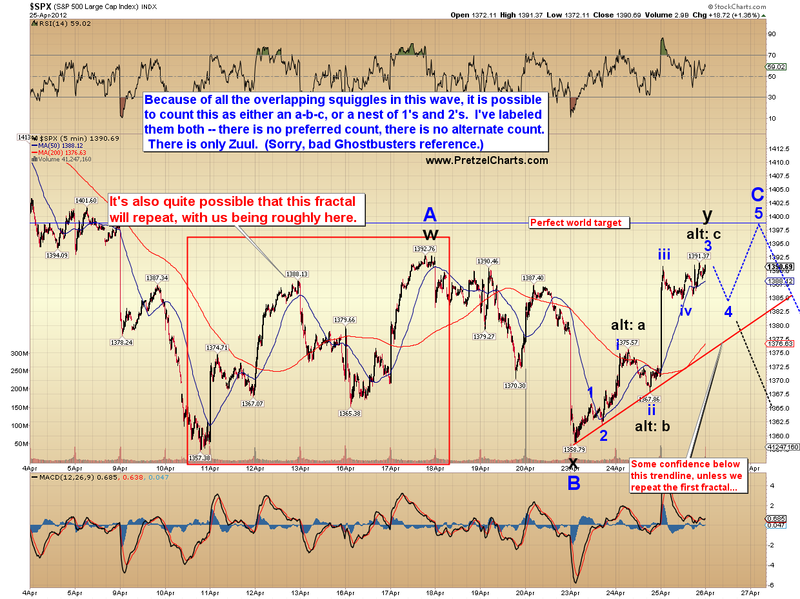 Regarding SPX move from 1392ish this past hour. Got some puts looking to catch a swing down based on overhead resistance and being in PL's zone for the flat to end, but TSI and MACD are NOT showing a reversal here from what I can tell. We'll see. 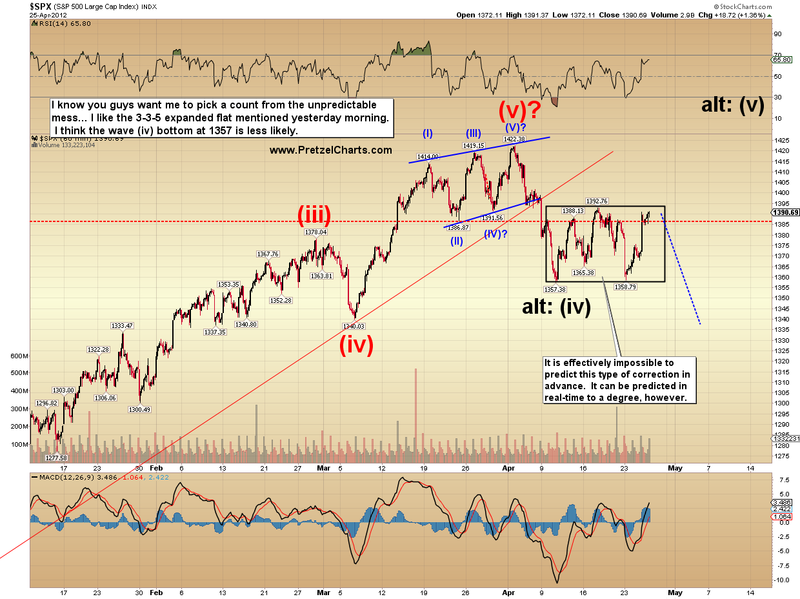 PL's SPX target for this wave is about 1 point above the current high. We are very close now. It still 'looks' like an ED - lots of 3 wave overlap -- perhaps it continued longer than i expected? Thanks' FWIW so far Conoco Exon, Oxy all missed their Q1 earning targets! Makes me wonder why would CVX hit their targets ... we shall know tomorrow and hopefully get a pull back for a quick puts covering.. This is what is troubling me. The MACD and Stochastic methods I use suggests that this has a high probability of being a break out to new highs, although a pull back maybe likely in the short term. With that said, volume is low. What do you make of this Max? don't quite get your point, EWs predicted that 1395 ES high I have been discussing. you just like to come to an EW site and bust balls, right? I'm really not the best trader on here - but I see 50% chance of a decent drop into the EOD so I'm putting my money on that. Sideways pattern here to be suggests consolidation -> at least one more move higher. I'm getting nervous, might bail soon. can anyone count this wave in the YMs ????? If CVX holds in here, then a quick retrace to $100 area. If it breaks up and heads for $108, then probably Wave 2 as stated by PL. Is Wave 3 down far off then? What timeframe are you referencing? Exactly, that is why I have trouble being objective when applying EWT. A top is always a 5th way in retrospect. It just seems that the application of EWT is best done after the fact. Does this look like an ending diagonal? Does this look steep? Yes! Now, it may turn out that this is does follow a sell off, but what if it keeps going to new highs? If it has been in a range for much of the month, the averages have broken up to the upside, not the downside. In honesty, maybe I was hoping for the downside to resolve itself given the counts, fundamental factors, and up until the last 3 days the technicals I use were favoring lower prices. So, I am not sure if "knowing" EWT has been worthwhile. Tgt if 95 ES hit, closing my long but it will prolly play around up here. there may be a shorting opp. soon tho. Added on to my puts just after the 1400.8 peak. If bears don't get control here I'm taking my ball and going home! so why are you posting on this site? don't hate. appreciate. I'm with ya bud. Did you see I replied to your Q on yesterday's thread? You'll have to forgive me but what does that mean? I've seen you mention that before but I can't figure it out. Guess it's a term I've not heard before :( Thanks! No, in fact I've used this method as one of primary ways of reacting to price changes. I am not looking for predictions or to bust balls. That is not my nature, and I am in no position to ridicule others. What I am trying to question is my own intuition and reasoning. It happens that my mind is seeing something similar to what people on this board are. That is why I come here everyday to learn in attempts to understand. With that said, I am hoping to come up with another way of seeing this count/ price action. My weakness as a trader is that I do not properly discount the what ifs. So today given the abrupt nature of the last few days, I thought it would be a good idea to seek out information for those that I find to be very good at applying EWT. Katzo, I mean you no disrespect. Ultimately, I want to study these markets for the rest of my life. I find them to be fascinating. This is why I seek to constantly improve. this is gunna bounce up and down for a while before it corrects. no biggie if you bought puts, but you HAVE to take a profits on those ASAP when a profit is offered. . .
Got 'em on packing sandals and a six pack. Not even gonna look. I either have it right or am gonna lose some money. I do think perhaps I maybe could have picked a better spot to try and learn to count and trade real time tho.....this has not been easy, however the market finally quit muddling around and gave up a clear 5 wave sequence to work off of. I say it is! But, I've been wrong before and will be wrong many more times! The problem is I want it to sell off because I am positioned for more downside. This may be coloring my interpretation. What's your take on a while? going into tomorrow? based on the action of the day and the plus 80 $INDU to 120 we just did, we will prolly end up around here at EOD. But I am lookin' for a corrective move at some point I will short into then buy the dip. Not yet ppl. . . .what EWs provide is the direction on any time frame you use, if you do not know the direction you are dead in the mrkt. You may get lucky at points, but you will end up giving it all back. . . .
see above post. . .
no problem, just post your thoughts and some charts. On what time frame? You have to understand what time frame ur trading. One person may be trading 5 min chart, someone else hourly, daily or weekly. Any EW5 is not likely to be 'the' top or bottom for the next 50 years...Do your own homework, make your own trades. If you agree with someone else's analysis, great, but it's still your trade. The market presents a set of probability distributions, not absolutes. Trade when you think the probabilities are in your favor. I agree. I can't see the weakness either, which means I was clearly wrong in my previous thinking. INDU and SPX Stochastic MI is 91 on the 30min chart.. The highest I've seen for a year and maybe longer. Amazing strength. what time frame are you using? I am some what new to EW. Have only been following PL for about 6 months. Can anyone tell me at what level PL's 3-3-5 flat becomes invalidated. At which point I am assuming PL's less likely scenario of a bottom at 1358 actually becomes more likely. CVX.....Down $2.40 on my short at $103.67. Plan B is in affect (no plan c, so this is it) Committed $1000 to trades on CVX, lost $430 on the April puts, down another $240 now on the 100 share short. Don't worry about me folks....all the knives here are from McDonalds and plastic doesn't cut very well. That's my ideal target to go short. Maybe we get there tomorrow. Look at your short term charts. I said 95 was tgt, we allow 1 to 2 points for tails or candle wicks above that. it goes up on ST charts to the tgt, maybe goes a bit above that, (the 2 point wick) then comes down, then goes back up to that point again and cannot go any higher, it stalls right there. that is the tel. I bet I will find a candle at 95 with the body of the candle high right at 95 and the wick above, the 95 level, on the 5 or 10 or 15 minute chart. you can also see in in the action of the candles. That seems like a lot of pain from here to there if one were short. one f-ing minute made the difference, it ain't over til it is over Max. Patience grasshopper. . . ppl are too impatient to try to make a profit, you have to stalk the mrkt. They're always at the ready to protect the bulls, and send out the bear hunters. don't know til EW1 & 2 is done, not in yet. . .
Another question from a newbie if others will allow. It seems as though we still haven't seen the 4th wave down in PL's count shown above so are we still in the wave 3 of this correction or did I miss something? Your right...kids are grown up so no more piggy banks to rob. Have to cash in some bottles pretty soon if CVX continues to levitate. Glad you mentioned teeth, I do have a bridge that might have some titanium or gold. Note to self: call the dentist. Yes and thanks. Am at work doing this on an Apple cell phone. Disqus will not do the reply thing on the phone will get back this evening. 'Never short a quiet market', so they say. This monkey is faking, it IS going to 1405 and INDU to 13254, a 180 day. Maybe. All to play for. This is so true. Honestly, trading has made me a much better person based off of this piece of wisdom. It is easy for me to get lost in a world I create instead of living the one that exists. Trading has improved my ability to be open minded while understanding that my biases are very real. At first, I thought it was best to eliminate bias and emotion. Now, I realize it may not be realistic and ideal to do so. Instead seek to minimize their impacts in my decision making. Yep K7 nailed it again, was there ever any doubt. Katzo I put on a light short using puts as my first ever attempt at trade based only on EW and oscillators. I sold what I believe was the intraday wave A to B move. I think this is the end of the larger 4 now looking for the beginning of the larger 5. Could take a couple days to bear out. No worries. Except for, you know, the collapse of, well, everything. How is the CVX chart looking? Are the candles getting into the cloud or will they bounce out of it? Thanks. The Beard doesn't allow that. He makes cash worthless so everything else increases in value...His friends at ECB seem to be catching on. Great, thanks for sharing. If I may ask, what software or site do you use to track this data? Thanks again for sharing, I appreciate it. Sorry, 4 minutes early... nice try though. Is your gap filled? Did the 1403 do enough? ThinkOrSwim is the charting software I use.